Great giveaway over at retromummy- check it out! Great giveaway over at Progressive Pioneer today- check it out! This new frog blanket is a big hit. E. says, "Hop hop hop hop hop..." every time he sees it. Polar fleece and flannel = uber cozy. 'Cuz the nights are still chilly, even if we're finally getting some well-deserved sunshine 'round these parts. Next up in the crafting queue? 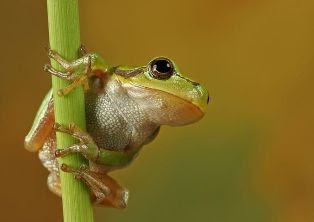 Frog stuff. 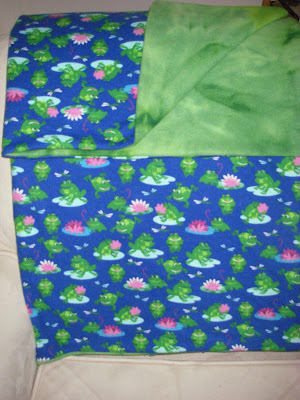 Frog pants and a frog blanket, to be precise. E. is currently a big fan of frogs ("Hop hop! Hop hop!") and has two stuffed frog friends, Hop and Ribbit. I'm continuing a tradition I started last Easter, wherein I make him a pair of pants for the holiday. This year it just seemed right to make frog pants so that he can hop around the house. 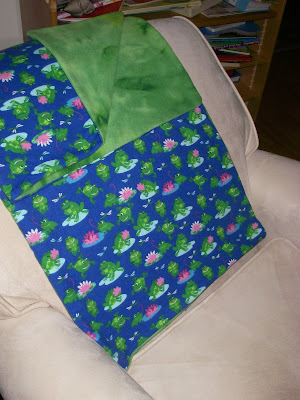 We went to buy frog fabric and there were two different bolts that really caught his attention, so I decided to make a pair of pants out of the cotton he liked and a fleece-backed blanket out of the flannel he liked. I keep forgetting to take pictures of stuff before I give it away. The cape turned out great- I hope Simran likes it. I may make another for E., if I do I'll be sure to actually photograph it! I crocheted this newborn-sized hat for a friend who is expecting a baby in several months. I wanted to use my son as a model for the photo because the hat is really cute, but of course if it's sized to fit a newborn, my little almost-15 month old child cannot be stuffed into it! So instead I give you the hat, modeled by a somewhat creepy-looking baby doll. I didn't use a pattern for this hat; I just double-crocheted and increased by doubling up stitches every few rows until I had something that was the right size for a wee one, and then made a big fluffy pom-pom for the end. I'm sure it will look much cuter on the actual child.